He’s baaaaaaaaaaack! And tonight, for Festivus, we’re airing some grievances. Allison is looking to become the first three-time champion in four weeks. She’s got a comfortable lead. 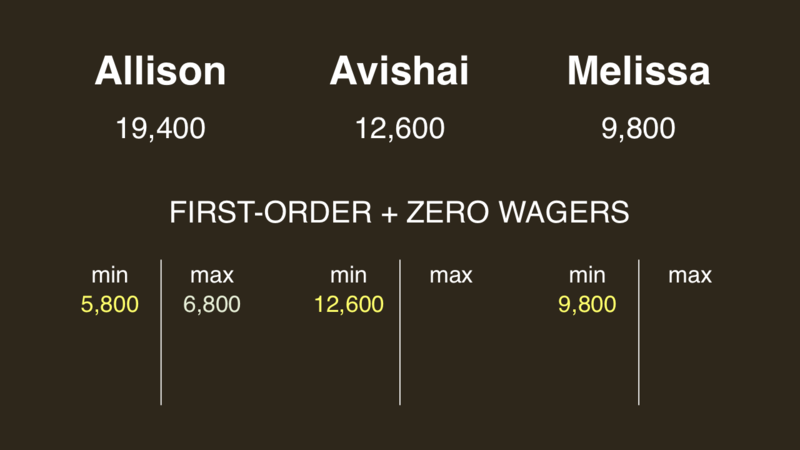 It’s a comfortable lead, yes, but it could have been a lock, had Allison been more aggressive on that $800-level Daily Double. The clue turned out to be a gimme. 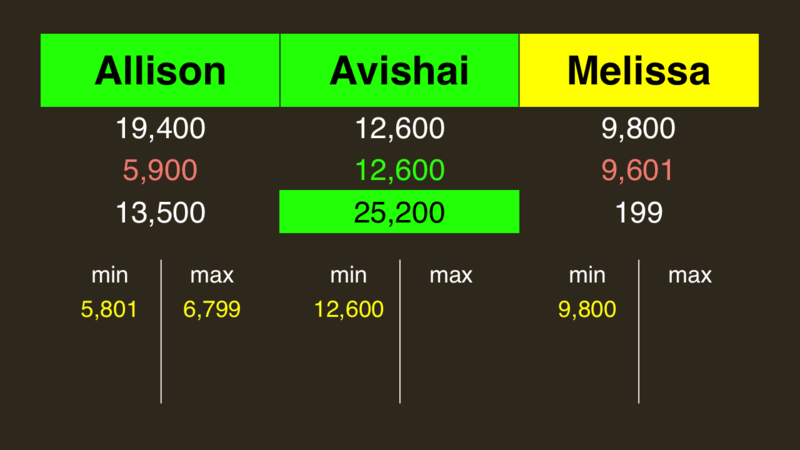 If Avishai doubles his score, he’ll have 25,200. 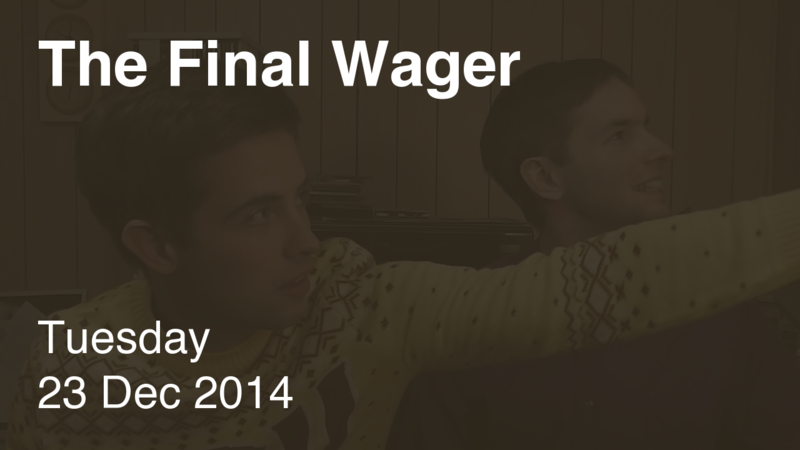 To cover him, Allison will need to wager 5,800. An incorrect response with that wager will leave Allison with 13,600. Avishai and Melissa must respond correctly to have a shot, so all-in is the way to go for both of them. Allison has some breathing room if she wants to go bigger: up to 6,800 to force both of her opponents to respond correctly. It’s Avishai taking the game with the sole get – and I’m a bit peeved at this article on Melissa for spoiling the clue for me. I think I would have gotten it, but I can’t be sure. I must say, too, it’s poor form to talk poorly about your fellow Jeopardy! contestants and fans. We each have our own way of watching (and preparing for) the show, and what works for one won’t necessarily work for another. Or might work better. What is the appropriate degree of difficulty for a Final Jeopardy Clue? I have been giving some thought to that problem for the past week or so. I had no trouble coming up with the correct question for tonight’s clue. But I frequently have no idea even where to start on some clues a lot of people think are “easy” and I sometimes easily come up with the correct response on “really hard” ones. So a single opinion from a single individual on the degree of difficulty doesn’t work very well. So what’s a better method? I have decided in the absence of some objective well agreed upon “degree of difficulty” standard to suggest this one. A final jeopardy clue has the appropriate degree of difficulty if one or two contestants get it right. It is too easy if all three get it and too hard if none of them get it. By that measure tonight’s clue was “just right”. I would also suggest that the show staff is getting it right if the say 10 show running average of “regular” (as opposed to tournament or other “special situation”) shows has between 40% and 70% of the shows ending up with 1 or 2 correct responses is 3 contestant finals. If the percentage moves out of this range consistently then they need to do some tweaking. Responses welcome. I completely agree with you! I’ve heard the writing staff also uses the “mixed bag” of responses as its measuring stick.